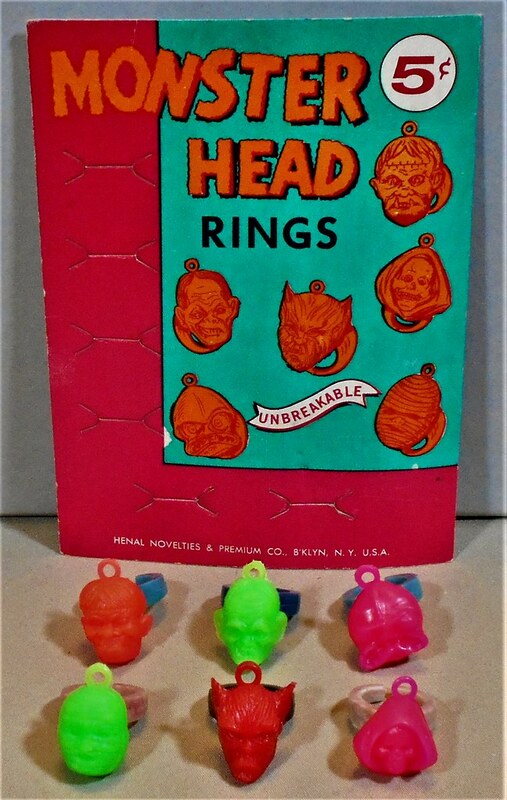 Monster Head Rings by Henal Novelties & Premium Co. (1960s). These are copied from the MPC Pop-Top heads except for the goofy looking one top row far right. They're exactly the same as the Pop-Top Heads except for the ring hole in the back and the loop on top. Not sure if Henal was part of MPC or had anything to do with them from a business standpoint, or if they just aped the heads for vending charms. Anyway, these are fairly tough to find these days and often expensive when they surface. They came in the brightly colored type as above, and also in the flat colored plastic. I recently picked up one of the flat colored ones in gray. I like both varieties. 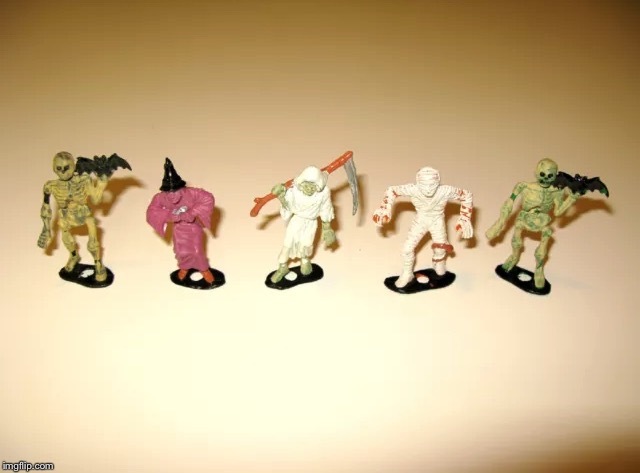 The brightly colored ones look garishly cool as a '60s monster toy should, and the flat colored ones show off the details of the great sculpts much better. It's not like we can just go out and buy the type we want. We take what we can get regarding scarce items such as this. I was just lucky to find someone selling the whole set a few years ago, and luckier still to get each one for only around $8 each. I think the display card set me back around $50 but I consider that a bargain, especially for one in excellent condition. Some of this stuff gets harder to find all the time. You never know when a warehouse find might happen, but the chances get slimmer with each passing year. I think the display card set me back around $50 but I consider that a bargain, especially for one in excellent condition. Some of this stuff gets harder to find all the time. You never know when a warehouse find might happen, but the chances get slimmer with each passing year. All very true! If you see a prize collectible from your younger years, grab it if the price is at all reasonable. You might never get another chance. This may have been mentioned already (I didn't bother to look through all 19 pages) but we shouldn't forget the model kits. 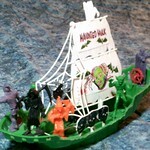 Particularly the Strange Change, Glo-Heads, Pirates of the Caribbean, Haunted Mansion, and Dark Shadows kits. 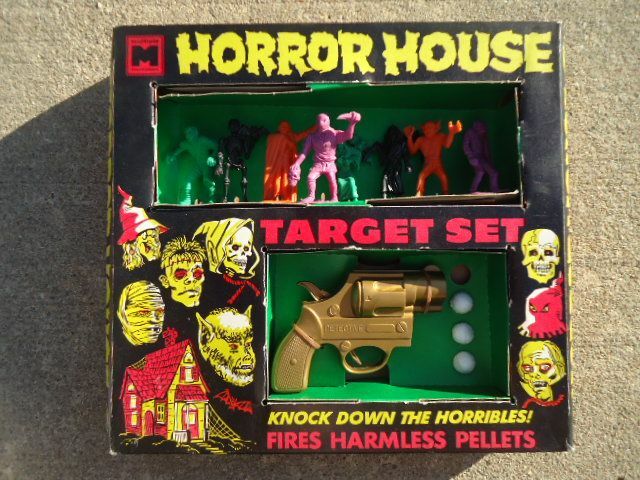 This thread is intended for the monster offerings of Multiple Products Corporation, aka Multiple Toymakers, like the Unbreakable Weird Monsters, Pop-Top Horrors, Horror House Target Set, Haunted Hulk, King Kong Jungle Set, etc. 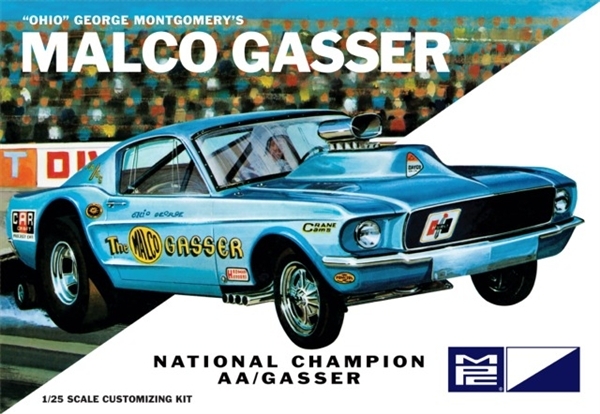 The model kits were made by Model Products Corporation (another company commonly called MPC). The rules are loose in UMAland so if someone wanted to post MPC Monster Model Kits here it should be fine, however more appropriately they should be posted in a thread in the Monster Kits section (as many already are). The pic is tiny because eBay won't let you bring up old listings these days to copy the full size pic. Anyway, I won this auction for a bit over $20 including shipping. I've sold Pop-Top heads for $15-$20 each in the past, and the Henal Monster Head charms are very hard to find these days, so I'm happy with the deal. I mainly bid on them for the Henal piece because I didn't have any of them in the flat color variety. And, luckily, I had an extra Pop-Top Monster (Frankenstein) body so I completed the Pop-Top with that orange head. Also got the purple Wolfman head to boot. Turned out to be a great deal. There is a listing on eBay currently for a complete set (6) of the Henal Monster Head Rings and the vending display card for $750. Granted, that's the shoot-for-the-moon price, but as scarce as these things are these days, and comparing them to similar sought-after vending charms, it seems they should have a fair market value of $40-$50 each. And, the vending display card for the Henal Monster Head Rings is much more scarce and more substantial (thicker) than many of the other monster charm display cards so comparatively those should be valued at around $100 if in excellent condition. These estimates are just my opinion of course, but I've been collecting and keeping up with this stuff for years so I have a measure of experience in this area. For items this scarce with so few prospective buyers willing to pay top price there's no way I would list them in an auction. I would list them high, but not outrageous, on BINs separately and just be patient. Something like $50 each for the Henal rings and $100 for the card, and add "Make Offer". If you have to sell items like this fast you'll be selling them for far less than you could get if you took a few weeks or months to move them. *facepalm* Ah. Somehow, I felt like I missed something. Sorry. It's cool. I didn't know the difference between the two MPCs either until Hepcat set me straight at the beginning of this thread. I intended the thread to focus on the monster toys made by Multiple and I assumed some of the models would be posted as well, until I discovered they were different companies. I love the MPC Pirates of the Caribbean kits! There's some recent reissues that I've considered getting to at some point. I recently did the Strange Changing Time Machine. (Not to be confused wit the Mattel "Strange Change Time Machine". So much wild cool stuff (since Ebay started up anyway), so little money. I noticed a listing for one of the Henal Monster Head Rings Display Cards on eBay for $49.99. I thought I'd watch it to see how long it lasted. I figured it would be snatched up rather quickly at that price, and sure enough it was sold in a day. The seller priced it at what I estimated to be about half the current value for one in excellent condition (as that one was). That's the risk with listing something as BIN without being familiar with the current value. The seller could have listed it as $99.99 BIN with "Make Offer" and realized much more than what he sold it for, maybe the full price if patient. The buyer got a good deal. Here's an oddity- a piece of the header part of the backing card for the MPC Weird Monsters packaging. This came with an eBay lot of Topps Funny Valentine cards that I won. Evidently the kid who accumulated the cards saved this piece of the packaging from the 1964 blister card. Strangely, the eBay dealer just kept it with the trading cards for the auction. This little piece of cardboard is one thing that influenced me to bid. I don't have the packaged example in my collection so I'm actually going to display this piece with my MPC Monsters. It is probably the best piece of the packaging since it's the iconic MPC Monster image. The kid who originally owned it thought it cool enough to save, so I'll display it to carry on the tradition. This brings up some food for thought and conversation. Just how much is a piece of original packaging worth? I guess first we need to look at the current value of the complete packaged toy. The MPC Unbreakable Weird Monsters MOC seems to sell in the $600-$800 range these days if the packaging is in good condition. I would estimate that the whole blister card might be worth $100-$200 if it had been opened and it doesn't contain the monster figures, depending on condition. Of course the thing that really tears down value is that it had been opened. 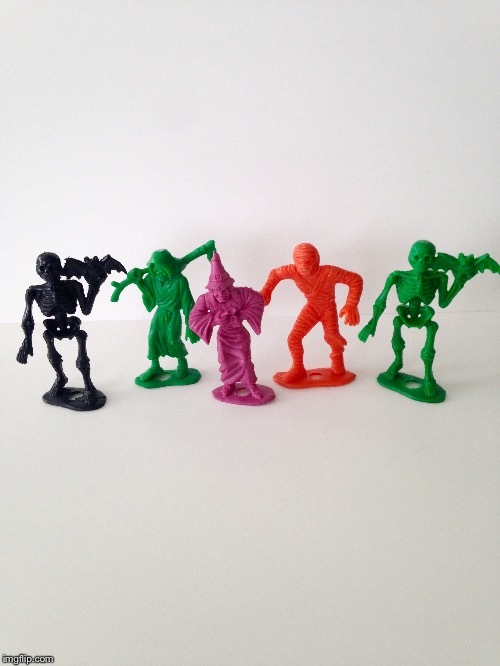 The monster figures can be bought for around $10-$15 each so they would be easy to replace. Just a piece of the blister card gets into some sketchy territory value-wise. As a ball park estimate I would think the complete header portion, or the complete backing card without the header, or the plastic blister portion, might sell for around $20-$40 depending on condition. Breaking it down to a smaller piece probably means it wouldn't have any value at all to most collectors, unless by some quirk of fate it just happened to be a piece they needed to complete the backing card (talk about "needle in a haystack"). But, I probably allowed an extra 5 bucks on my high bid for that piece with the MPC Monster image and that's only about half the header portion of the card. Hard to put a value on a piece of packaging but I guess I did just that when I bid an extra 5 bucks for that half a header card. Occasionally you see a cover, or even just a page, of a mega expensive comic book being sold for a lot of money. Some of our Monster collectibles are getting so expensive I guess pieces of packaging really do have a bit of value.